Microsoft is continue pushing out few update for Windows 10 Build 10240 to Windows Insider members both fast and slow ring, as the team continues to prepare for the official launch of the Windows 10 on July 29. If you not yet updated to the latest Windows 10 Build 10240 update, now would be a good time to check it. Microsoft has pushed few update such as KB3074667, KB3074674, KB3074679, KB3074680, KB3074686, and more. For update KB3074680, Windows not only fixes three vulnerabilities, but also brings some changes to enhance the functionality of Windows 10 through new features and improvements. In addition, Microsoft also strongly recommend Windows Insider members update Windows 10 Build 10240 to the latest update version for experience and access the new Windows 10 Store. Now Windows 10 users can check through Windows Update to make sure have installed the latest build and the most recent updates. 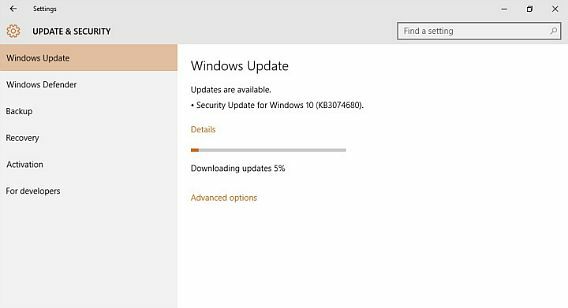 To update, go to Start > Settings > Update & Security > Windows Update > Check for updates. This security update resolves a vulnerability in Microsoft Windows. The vulnerability could allow remote code execution if a user opens a specially crafted document or visits an untrusted webpage that contains embedded OpenType fonts. To learn more about the vulnerability, see Microsoft Security Bulletin MS15-078.Additionally, this update includes non–security-related changes to enhance the functionality of Windows 10 through new features and improvements. This security update resolves a vulnerability in Windows that could allow elevation of privilege if the Windows Installer service incorrectly runs custom action scripts. Additionally, this update includes non-security-related changes to enhance the functionality of Windows 10 through new features and improvements. Important If you install a language pack after you install this update, you must reinstall this update. Therefore, we recommend that you install any language packs that you need before you install this update. This security update resolves the following vulnerabilities in Microsoft Windows. The vulnerability could allow remote code execution if a user opens a specially crafted document or goes to an untrusted webpage that contains embedded OpenType fonts. To learn more about the vulnerability, see Microsoft Security Bulletin MS15-078. This update improves the Windows 10 out-of-box experience (OOBE). This update applies only to the Windows 10 OOBE process and will be available only at the time that OOBE updates are installed. This update is installed during the Windows 10 OOBE process. Important: If you install a language pack after you install this update, you must reinstall this update. Therefore, we recommend that you install any language packs that you need before you install this update.